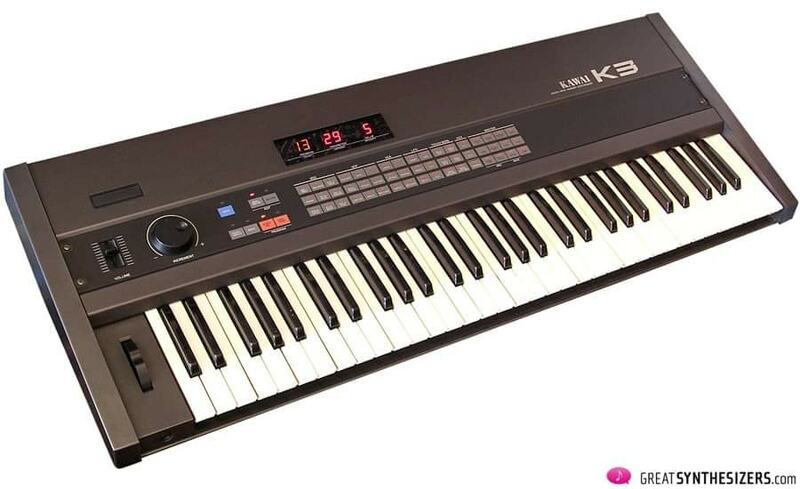 The Kawai K3 is a typical representative of those mid 80's synthesizers: membrane buttons (instead of real buttons), an Alpha Dial which is used to edit the extensive selection of parameters, plus a six-voice hybrid sound engine. The latter consists of two wavetable oscillators, a VCF and a VCA per voice. The LED display is huge (similar to that of a Korg DW-8000, but much bigger). The wavetable oscillators, on the other hand, can easily produce sounds similar to a PPG Wave synthesizer. The OSC BAL(ance) function, on the other hand, is very professional. This parameter determines the mixing balance for the two ocillators. “-15″ is oscillator No.1 only, “0” is even, and “15” is oscillator No.2 only. PRES(sure) OSC BAL(ance) is even more effective, allowing for modulation of the mixing balance between the oscillators via aftertouch. This results in organic, evolving sound clips. The instrument’s name – DIGITAL WAVE MEMORY SYNTHESIZER – derives from this possibility of programming your own (user) waveform out of harmonic components. Now, please listen to the soundfile “all waveforms” at the end of the article. It contains – what surprise – all 32 waveforms (31 factory- and 1 user-waveform, noise is left out). As with the old PPG synths, the amplitudes of the single waveforms differ considerably. That makes continuous wave table sequencing a little difficult – you don’t want any waveform to “jump” out of the speakers, while, in the next second, others seem to fade away into nothing. PRES LFO OSC determines the amount of vibrato added. I never feel good about comparing instruments with each other. But sometimes you just can’t avoid it, when discussing products with similar features. 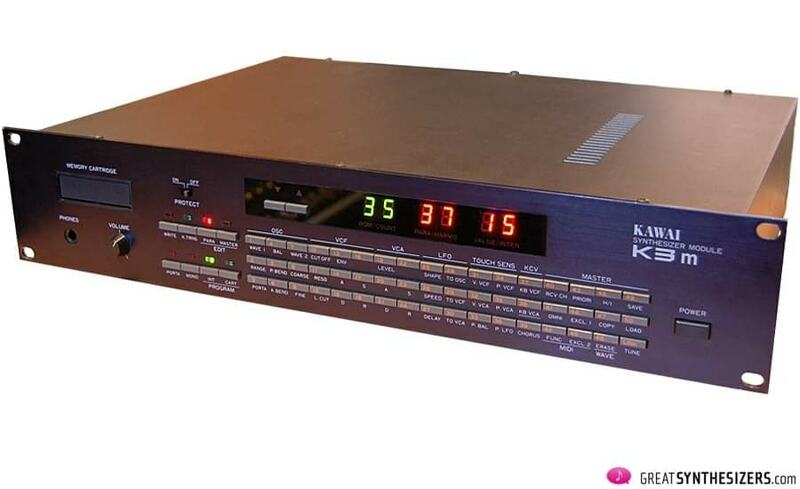 The Korg DW-8000 (again, a typical 80ies hybrid instrument with a mix of digital and analog components) is often seen as a direct competitor to the Kawai K3. It has 16 waveforms plus VCF and VCA. The arpeggiator is wonderful – a nice toy to play with, and an inspirational tool for creative soundscapes. The joystick is very flexible, allowing for modulations in both X/Y directions. All in all, the performance section on the DW-8000 is better than that on the K3. Sound wise, I’d call the K3 a little more PPG-like, while the DW-8000 offers more raw analog sounds. Both instruments are professional synthesizers with a character in their own. Stereo Ping offers a specialized midicontroller allowing realtime edits on the K3 / K3M. “The midi controller will be plugged in between the midi sending device and your synth. It merges incoming midi data with it’s own parameter change commands and forwards both to your synthesizer. Means: you can perfectly fire your synth with midi notes while tweaking it’s sound with the synth controller – realtime. The 16 dials of the Synth Controller are split in 3 color layers, each knob has printed up to 3 parameters under the knob. By pressing one of the 3 iluminated push buttons you select one of the layers. In consequence you got up tp 48 parameters in direct access. The K3 doesn’t have that many bad features. Turn off the noisy chorus (if that is the case with your K3) and you’ll be just fine! Slow envelopes are a common phenomenon on many mid-80ies synthesizers. The VCF is ok, not as well sounding as any of those “big” poly synths (Roland Jupiter-8, etc. ), but much better than most of the digital substitutes that followed a few years later. Nonetheless, the Kawai K3 is a professional machine. Try to find one, if you like its sound – and don’t forget to turn off the internal chourus! den wollte ich auch immer haben, hat aber nie geklappt. Hat jemand mal verglichen mit dem VST (http://forum.music-society.de/showthread.php?tid=5884)?